Is it your condenser, compressor, temperature control or evaporator fan that is preventing your GE refrigerator from cooling? GE refrigerators are reliable appliances that should last you at least 15-20 years so if stopped working and before you decide on throwing it away, contact one of our technicians for a quick consultation. We are ready to repair your refrigerator at a fraction of cost of buying a new one. Are you having trouble with your GE oven not heating, burners on the stove not lighting, oven door not opening, temperature gauge not working, pilot not lighting, or some kind of electrical or power issues? LaFixit will be happy to repair your oven whether it’s gas or electric and we can do it very fast. As our repair and service technicians carry most of spare parts for GE appliances. It could be many things causing your oven to not work properly in any case you must be very careful especially if it is a gas oven. Call us today to schedule an appointment and we will send an experience GE repair technician out to your home today. Call today, (818) 906-2715 , for GE Monogram and GE Profile repair. We will schedule a same day or next day appointment for a small service fee. Is your GE washer not spinning, making a loud noise, won’t agitate, won’t drain, vibrating too much, filling too slow, leaking water, won’t start, overflowing, lid won’t close, lid won’t lock, or stopping mid-cycle? Do not try to fix this yourself as water damage could be a lot more expensive than what one of our experienced technicians will charge you. Getting the problem diagnosed correctly is half of the work. Leave it to professionals. This way you will get an accurate estimate of the repair cost with no surprises and best of all, we will wave the diagnostic fee if you decide to move forward with us! Is your dryer not starting, not heating, not tumbling, door not locking, not drying, won’t stop, tripping breaker, too hot, making too much noise, won’t turn at all, stop in mid cycle? Your GE Dryer is not working properly and sometimes there is more that one issue or several parts that need to be replaced. The best thing for you to do is to call us today so we can get an experienced GE technician out to you so you do not have to take your clothes to a laundromat. Do not try to fix this by yourself especially if it is gas, it could be a fire hazard if this is not fixed properly by a trained technician. Is your GE dishwasher not cleaning, not draining, buttons not working, leaking, motor not working, won’t fill, making noises, won’t start, won’t latch, showing error codes, dispenser won’t work, stops mid cycle, overflowing? GE dishwasher is a fantastic appliances, a work horse in the kitchen and it deserves the best treatment. We use original parts and are usually able to schedule an appointment the same day you contact us with service request. 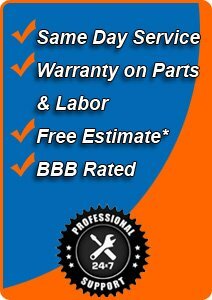 Call (818) 906-2715 for fast, affordable and reliable service!